ARB3500520 With the introduction of the new ARB Intensity LED driving lights and their use of Deutsch waterproof connectors, ARB has developed a new loom based on the 3500440 Auxiliary Lighting Loom. The new loom features the same mouse style switch and harness, with Deutsch DT-06 connectors in place of the bullet type connectors used for ARB fog lights and IPF lights. In 2009 ARB engineers started a development program to produce an ARB driving light with a completely new design incorporating the latest LED technologies. Unlike light bars that were growing in popularity, ARB required a light that was compatible with current bull bar designs and traditional driving light mounting points. They also needed to be a legal fitment which, in many states, light bars are not. Many ARB customers prefer a combination of a spot and spread driving light due to the various driving conditions encountered in general off-roading. Most LED light bars on the market are considered great lights for slower off road driving where the ability to see great distances is not so critical. For ARB’s new light to compete with the best the market can offer in Halogen and HID lighting, it needed to give not only the broad flood beam associated with light bars but also a spot beam with the ability to penetrate longer distances. Integral to the design was the need for the light to be robust and suited to the conditions encountered off-road like the constant vibrations of corrugated roads, animal strikes and the ability to be submersed. With the general abuse that off-road driving can dish out, the light also needed to be serviceable. During the development stage, many advances in LED and optics design meant that the LED array and circuitry changed numerous times. With many tens of thousands to be invested in tooling, this meant that the design of the light body needed to be ‘future proofed’ so that further advances in technology would not require re-tooling. The final design utilizes a pressure die cast aluminum light body that acts as a heat sink where the removable LED circuit board containing SMD LEDs mounts into the front face. The Hybrid Optics (reflector & lens) are then located within a retaining bezel and held in place by the polycarbonate lens. Any future advances in technology therefore only require changes to the circuit board and optics. Although SMD (surface mount) LEDs run very cool in comparison to traditional resin encased LEDs, the circuitry and associated components that power them get quite hot, requiring large heat sinks and cooling fins with increased surface area to draw the heat away from the circuit board. This required that the light body be manufactured from aluminum but due to its round shape, a pressure cast aluminum body was preferable over an alloy extrusion used in light bars. With the light assembly weighing close to 6.75 lbs, a mounting system was designed from TIG welded 304 grade stainless steel to ensure integrity under the harshest conditions. Stainless steel offers considerable strength over other designs and with a requirement to handle vibration, prototypes of the new light undertook Military Specification vibration testing on a shaker table by an approved facility in Melbourne. Attached to an ARB bull bar the shaker table put both the light and bar through severe testing, with both the light and bar mounts resisting fatigue and passing the test. Further testing was then carried out to ensure the light was waterproof, with the light achieving a rating of IP68. IP ratings are an international code giving an Ingress Protection Rating and classifies in this case the level of protection given to an electrical enclosure. The ‘6’ in the code relates to solid particle protection and is the highest rating: Dust tight-No ingress of dust; complete protection against contact. The ‘8’ relates to liquid ingress protection and is also the highest rating: Immersion beyond 3.25 ft. – The equipment is suitable for continuous immersion in water under conditions which shall be specified by the manufacturer. To finish the outer surfaces of the light to ensure durability under the harshest conditions, the aluminum body is finished in a textured polyester powder coat that passes the ISO7253 3000 hour salt spray test. The lens retaining bezel is finished in a UV resistant red two pack automotive paint. 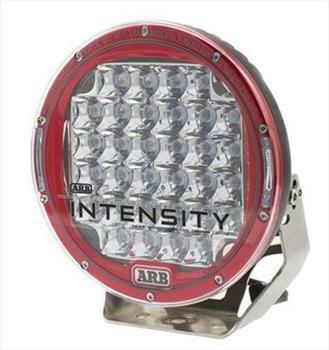 This combined with the 304 stainless steel mount makes the ARB Intensity light extremely corrosion resistant. Performance of the light can only be described as intense and hence where it derives the name ‘ARB Intensity’. At 6500K, the color temperature of the LEDs is as close to daylight as possible and with 32 LED’s per light producing a broad beam, even on spot versions the lights illuminate everything in the driver’s forward field of view. No longer does the driver find themselves straining to see beyond the edge of the beam, hence reducing fatigue.